David Jassey, a former member of the Gambian Integration Committee and its executive, tells about the self-organisation of the Gambian refugees in the Donauwörth asylum camp (Bavaria, Germany) and analyses the effect of the massive police attack in the the camp on 14 March 2018. The 30 Gambian refugees who were arrested in this operation still suffer from their victimisation (more information on the support campaign, see end of the text). 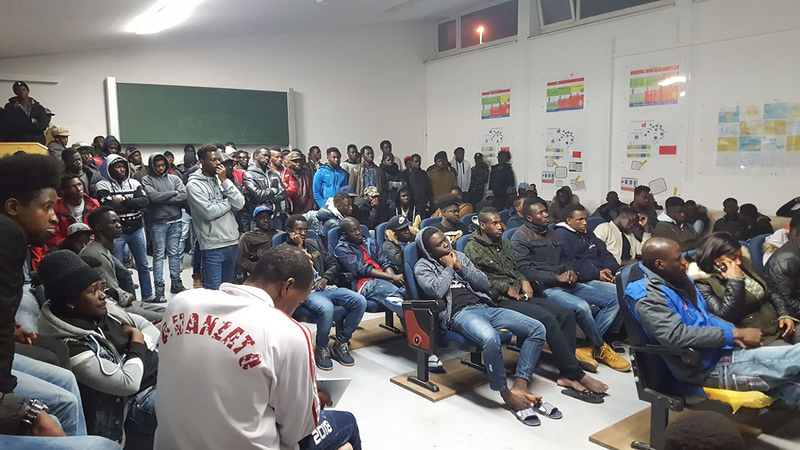 Between November 2017 and March 2018 Gambians were the majority among the refugees in the Donauwörth asylum reception camp even as there were also other nationalities like Turkish, Georgians, Pakistanis and Somalians. We Gambians came to first know one another in the camp. 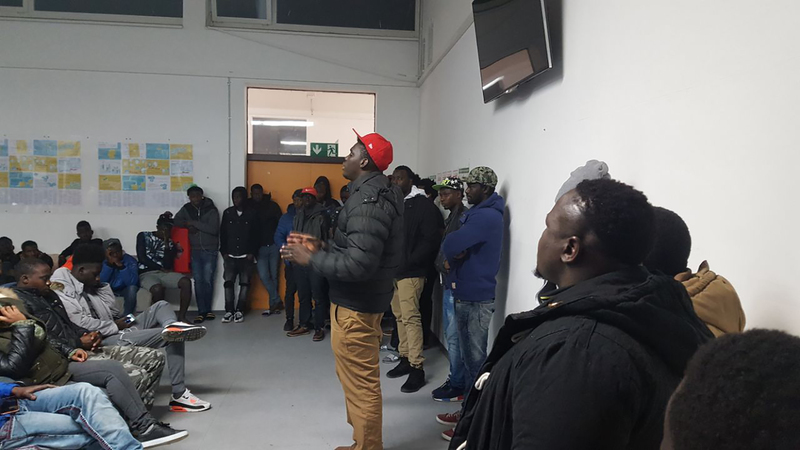 Although we were confronted with a lot of difficulties in the camp as asylum seekers, we knew we needed to organise ourselves if we wanted to be integrated in our new German society, As people who had just met each other in the camp we had to start from somewhere, no matter the challenges. To get to know each other better we first organised evening dance and singing , indoor games and soccer, to help us building trust. Then we started having general meetings once a month, and when the Gambian community became more interested, they requested to hold the meeting weekly – Thursday became our meeting day. In the process of self-organisation we come up with ways to meet the Donauwörth community: by (a) going out for voluntary community work or service like cleaning some public places, (b) organising a day to meet the youths at the vocational school where some of our colleagues were also learning, (c) organising a day to visit two Kindergartens, and also by (d) organising a day to give a public talk at the Donauwörth townhall. We wanted to inform the natives and the interested persons about us and then allow for gradual integration into the society. However all these plans of socialisation with our new community of Donauwörth were overcome by problems that we were facing within and outside of the camp on a daily basis. For example (i) the social office blocked our pocket money immediately when one received a negative response from BAMF on one’s asylum case, (ii) the health centre refused to attend our colleagues with hepatitis B+ and for stomach or head ache the doctor wrote a prescription to buy medicine outside of the camp, (iii) the Malteser security personnel were so hard on our colleagues: For instance when a colleague had some misunderstanding with a security guard, before you knew it you would see the whole security personnel running from all angles of the camp towards that direction and reaching the scene, without asking any question, they would pin the refugee on the ground while others would be on the head, some on the body and some others on the leg, (iv) the police were harrassing our school-going colleagues on the way by searching while other students would stand by, and then would give them humiliating statements like “What are you doing in our country?” or “Why can’t you go home to your country?”. This harassment took place on a daily basis. An executive was selected to help to deal with these situations and to negotiate with the authorities about the issues and concerns of the Gambian community in the camp. The community called itself the Gambian Integration Committee, the executive was understood as its mediator towards the authorities. At the request of the Gambian Integration Committee, the excecutive wrote on the 23rd January 2018 its first letter to the government office in the camp, the representative of the camp management, requesting for very basic things, for example equal treatment of all refugees regardless of their nationalities, unblocking of our pocket money, and for a working permit. On the 29th January 2018 we wrote a follow-up letter. Hence we did not receive any response from the government office in the camp about our concerns, the Gambian Integration Committee decided to stop providing the services that it was offering within the camp, beginning on the 12th February 2018. It was also the very day that the executive was sent to the government office in the camp to make a verbal follow-up of the two letters sent to the same office. The executive met with Mrs. Glass, head of the government office in the camp. Already very angry, and without listening much to what the executive had to say, she gave the executive an ultimatum of twelve minutes to get all the Gambian working refugees back to work or else they would never work anymore. In the afternoon while we were having lunch in the canteen, one of the ladies who serves our food came out with her smartphone and started shooting a video of us as we were eating. We asked her to delete it as we didn’t permit her to tape us, but she refused and ran in the kitchen. The Gambian refugees were angry and sad by the event happening around them in the camp, so they decided to go back to Italy on foot. Reaching the Donauwörth train station the refugees were met by police force who stopped from going further. For the first time the refugees came to know that the camp has a director and he lives in Augsburg. The director on that moment entered in negotiations with the refugees to go back to the camp. At this point the executive stated the difficultites that we were facing in the camp, and the camp director promised to facilitate in seeing them been solved. Also he promised to call for a meeting on the following day where all these issues would be addressed. On the 13th February 2018 the meeting was actually held as promised, however he rejected all the promises he had made in the previous day as to facilitate some of the problems that we were facing. After the event of 12th February 2018 the situation in the camp became even more unfriendly for the Gambian refugees, so the executive had to enter into negotiations with the authorities where the director and the police were always present. In between, the executive and the Gambian Integration Committee held a lot of meetings which served to strategise where to lodge our complaints. On the 21st February 2018 we obtained an open demonstration permit from the Landratsamt. On the 27th February 2018 the Gambian Integration Committee made a restatement of eight demands as requested by the Maltheser for the then upcoming meeting scheduled for the 1st March 2018 which was organised by the director of the camp. In that meeting all of the eight demands that we had handed over for the meeting were rejected, except the one concerning the Ausweis (ID). It was agreed that there would be no writing on or red strip on our Ausweis. To confirm this agreement, the executive sent one of its members to change his ID in the Haus 47. As this was rejected we realised that the agreement had been dishonoured in our absense. On 7th March 2018 the executive visited both Haus 47 and the government office in the camp to inquire for reasons that had lead to the nullifying of the agreement without our notice. We did not get any satisfying explanation. On the same day we decided to halt providing the services offered in the camp while the students also stopped going to school. All this was to demonstrate our dissatisfaction for disregarding our agreement. The situation remained so – no work or going to school. Not until 14th March when the police received some information that one of our colleagues who was due for deportation to Italy was in the camp on that night. So about 3 AM while the refugees were asleep, the police came to arrest the gentleman. It happened that they never found him. The police started knocking on the doors of other refugee rooms, waking refugees on the ground floor. At some point the fire alarm went off and refugees of all nationalities in Haus 11 came down seeking for safety as we had been taught in our first meeting by the accommodation management. When the police saw the growing number of refugees coming down they drove away and claimed that the Gambian refugees had prevented deportation. Let us differentiate between these two words: Prevent and protest. To prevent means to impede or block something from happening. 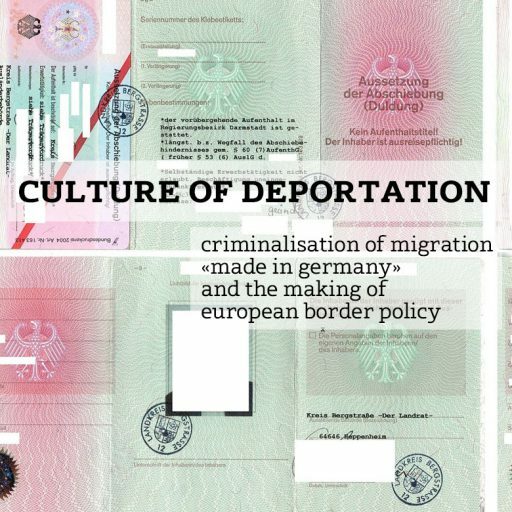 In this case, the usage of the word “to prevent deportation” is not feasible because in the first place, the refugees never knew that the police would be coming that night to arrest a collegue for deportation, hence nobody blocked the police from driving in to the camp. Secondly, it would have been senseless for the refugees to try to prevent the deportation because in fact there was nobody to be deported – as the gentleman was not found on this bed. On the other hand, the word protest means to state verbally that one does not agree with what had happened or said. In this case the usage of the word protest would have been more appropriate if some colleague did disagree with the police for waking them up in that early morning. The rest of the day passed well until around 2 PM when we saw about 60 police vans and about 200 police officers running side by side with these cars while other police officers manned the circumference of the camp fence. Every exit door in the two buildings, Haus 10 and Haus 11, were taken under control at once, with several officers standing at each. The police were very armed with: short guns, battons, tear gas, pepper spray, metal and plastic handcuffs, long sticks, dogs, ropes and protective gears like helmet ans gloves. In the corridors the Gambian refugees tried to ask the police what was going on and why they were in the camp, but all we received as answer was pepper spray on our faces. One of our colleagues who was affected by the pepper spray collapsed and admitted to the hospital. At some point two glass windows and a glass door were broken as refugees struggled to have enough ventilation after pepper spray had been injected in the corridors. We refer to this police action as police violence because there was absolutely no need for their harsh and dangerous actions. I would like to underline that it is rare that protection seekers will seek to challenge the laws and conventions of the society. With this in mind, statements that refugees are “aggressive” or “dangerous” are unfounded and rather operate as political arguments to justify the isolation of refugees. The local community is thus split and the freedom of movement of certain people is denied. At some point in their operation, the police forced the refugees and came up with three strategies to arrest refugees: (i) the Malteser provided the police with a list of names (ii) the Malteser security and the police were going from one room to another pinpointing refugees to be arrested (iii) the refugees were asked to hand over their ID’s and put their hands forwards so that the police can feel the refugees hands as to know who is to be arrested or not. The whole police operation took four hours. The intended deportee was nowhere to be found. By the end of the operation 32 of our colleagues were arrested. Two of them were released on that evening in Augsburg and were transferred to Heims on the same evening. The others were taken into pre-trial custody. On the same evening the police made a press release on how the Gambian refugees prevented deportation and how aggressive they were. They publicly stigmatised the arrested persons as “rioters” and “ringleaders”. The following day the Bavarian interior minister Joachim Herrmann announced his visit the Donauwörth refugee camp, there then we thought we will also have the chance to narrate the story about the event. Later in the same day the Gambian refugees heard that the minister had commented that he does not want to speak with Black people. Hence we also decided to stay indoors during his visit. After Herrmann’s visit to the camp on 15th March 2018 the executive decided to engage in an intensive campaign that would bring awareness about what actually happened. We for instance organised a press conference on the 22nd March 2018 giving a detailed narration of the situation. On the 26th 2018 the we organised a demonstration in Munchen demanding the release of our colleagues and requesting for justification of the police action on the 14th March 2018. On the 29th March 2018 we again staged another demonstration in Donauwörth which denounced the police action, called for the release of our collegues who were still in pre-trial detention. We requested for the German goverment to give us hope in stead of putting us unjustly behind bars. The executive gave online interviews, radio shows, and TV interviews. Sadly enough for the Gambian refugees the media was quoting our statements wrongly to suit their own opinion on the matter. At the end, the executive refused to give any more interviews. We wrote letters to give members of the Integration Committee the opportunity to visit our colleagues in prison. All applications were rejected. In mid-May, the police gradually released our colleagues from pre-trial detention. Some were deported directly from the prison to Italy, others were transferred to Heims. Each of the freed received a penalty order (Strafbefehl) for breach of civil order (Landsfriedensbruch), some additionally for resisting execution officers. Only those under 21 years old were not charged. Seven persons objected to the penalty orders, ready to go to court to fight their case. By mid-August, three of them had already been deported to Italy. The remaining four are seriously threatened by the Dublin procedure. The police attack in Donauwörth and the deportation orders left the Gambian community in fear and terror. Deportations became more frequent and aggressive since the incident, people being picked up for deportation almost every night at two or three o’clock in the morning. Many left Germany by themselves, simply because they were afraid. In the beginning of the year around 360 people from Gambia lived in the first reception camp in Donauwörth. Meanwhile there are maybe 50 people left. Donauwörth has become a terrifying place. David Jassey was an active member of the Gambian Integration Committee in the Donauwörth reception camp. Later he was transferred to a Heim in Unterwegen. The first court hearing against two of the Gambian refugees who contested their penalty orders will take place on 7th November at 1 pm at the Amtsgericht Augsburg – under the condition, they manage to survive their Dublin period. Different groups and individuals from Bavaria, Baden-Württenberg and Berlin have started a campaign to support the court cases and the rest of the released persons (contact: davejassey@gmail.com).